Many of us enjoy hiking. It is an activity that can not only bring people together, but also help them to get closer to nature and release stress. Whether you are travelling alone or in a group, one thing is certain – your boots are going to end up muddy. This guide looks at the best hiking bags for your boots, so you don’t have to worry about messing up your car or home. Easy and efficient, these hiking bag reviews should give you some insight into what to buy. Choosing a hiking boot bag is not a particularly complex choice, as while there are quite a few brands and models the designs do not differ a great deal. One of the main things to look at when it comes to choosing your boot bag is whether or not it is water resistant. A water resistant boot bag can help to improve drying time as well as prevent leakage and further dampening of your boots. Boot bags with a double zip on them are often the best ones to go for, as this means if one zip breaks for any reason, you have the other one to keep the bag secure instead. You should also try to look for bags that have thicker material around the outside to prevent any form of leakage. A bag with ventilation can be quite handy as it means that your shoes will dry out faster and are less likely to smell or gather mould on them. This means that if you forget about your boots in the bag, you won’t have to worry too much about what you might find when you go to prepare for your next hike. When looking at different types of bag, it is important to note the little features. These are things like feet on the bottom of the bag. If you have a wood floor, it is more likely to get scratched or scuffed. 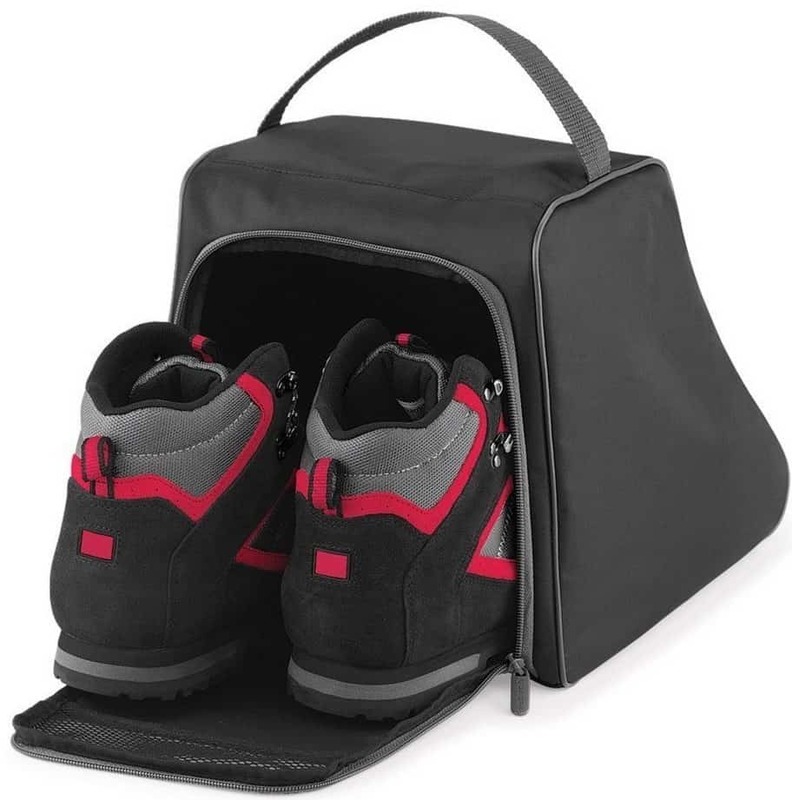 As a result, purchasing a boot bag that has rubber feet can be very beneficial for your flooring as well as the overall sturdiness of the bag. Making sure you get a bag that will fit your boots is important as well. The majority of bags are one size fits all, but some of them will cater to smaller feet. As a result, it could be harder for you to find an appropriate bag if your feet are larger than an 11. Always check the listing carefully before you buy. A boot bag that is easy to clean is often a good way to go. After all, washing out dried clumps of mud from a fabric bag can be rather tiresome and so looking for something that is easy to clean can be very advantageous to you both in terms of time and effort. All that’s left is to choose the perfect pair for you. 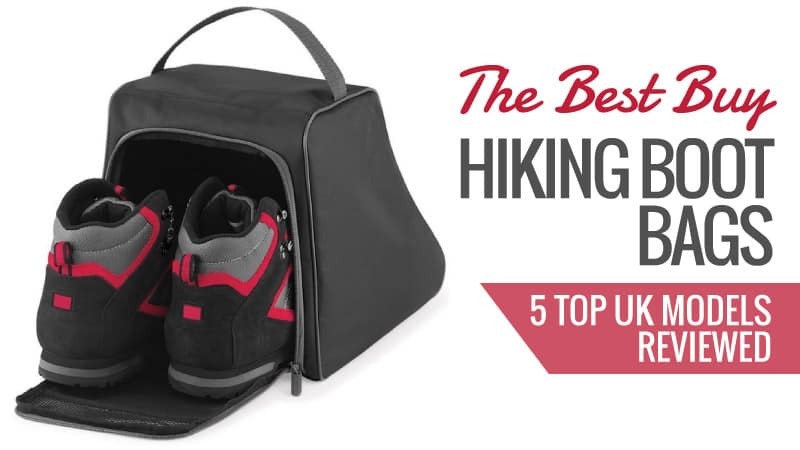 Take a look at our hiking bag reviews for some of our favourite models. A popular and reliable brand, QUADRA have created this excellent boot bag for your walking boots. At a low and very reasonable price, it’s worth checking out the reviews to see if this is the right boot bag for you. This bag can fit just about any size walking boot inside of it, and they slot in nicely so that mud and muck doesn’t spread across your floor. It is made of a plastic-type material with a soft textile lining, and there is a mesh window for ventilation. This way, your shoes can breathe so that mould does not grow and smelly bacteria cannot fester. It has an internal baseboard for extra support, as well as a fourteen-litre capacity. There is also an easy carry handle on the top for excellent portability. While it does fit larger shoes (size 12/13), it is ideally made for a size 9 and so the larger shoes may stick out a little when you zip it up. Affordable, practical, and easy to carry around. Those three points are what makes this particular carry case so appealing. With a breathable mesh window, you can also rest easy that the smell of your shoes is less likely to build up and that mould is also far less likely to form on your boots if you forget to remove them before your next hike. A good buy at a good price. Regatta makes some of the best hiking boots, and so it is only natural that they would create a sleek and reliable boot bag to go with them. Whether you own a pair of Regatta boots or not, this bag is sure to keep your walking footwear comfortably inside, and at a cheap price it can be hard to resist. 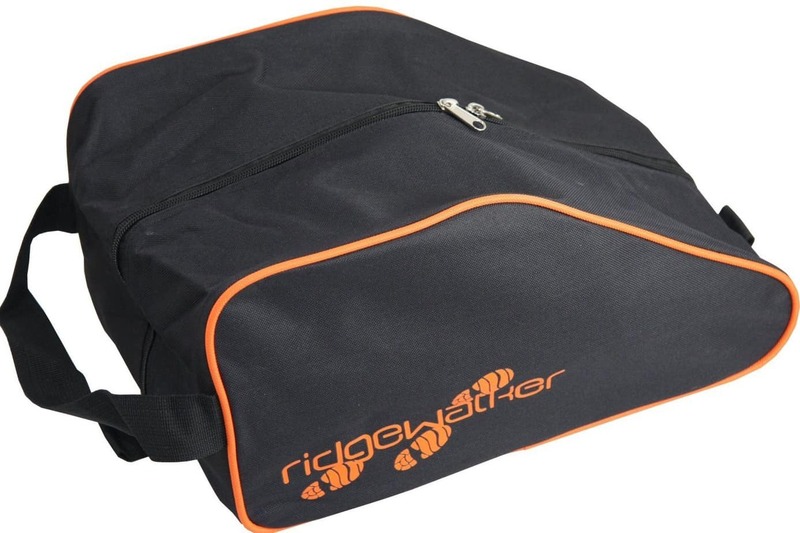 This boot bag is made from hardwearing polyester, making it incredibly durable and reliable for extended use. It has a webbed carry handle that is both discreet and easy to access, adding to the overall sleek design of this nifty boot bag. The inside is lined with a soft polyester, and the bag was designed to keep your muddy hiking boots away from the rest of your belongings and equipment, as well as ensuring the car remains clean and free from mud. Plus, they even fit size 13 shoes with a little room to spare, so it is great for all foot sizes. There have been no issues with this particular product so far. Made by a popular and trusted brand, they have been sure to keep to their high standards of quality when creating this boot bag. So next time you are planning on going hiking but don’t want to drag mud everywhere on the way back or in your home, it might be worth picking up one of these and keeping your mucky boots inside. Q: How big is the bag, how many pairs can you fit in? A: Just the one pair but big enough for a big pair of mens boots so plenty of space. If you are looking for something simple and less bulky, then this boot bag might be the right one for you. Available at a low and reasonable price, this nifty little bag might just be your next boot holder when you go hiking. Take a look at the reviews below. 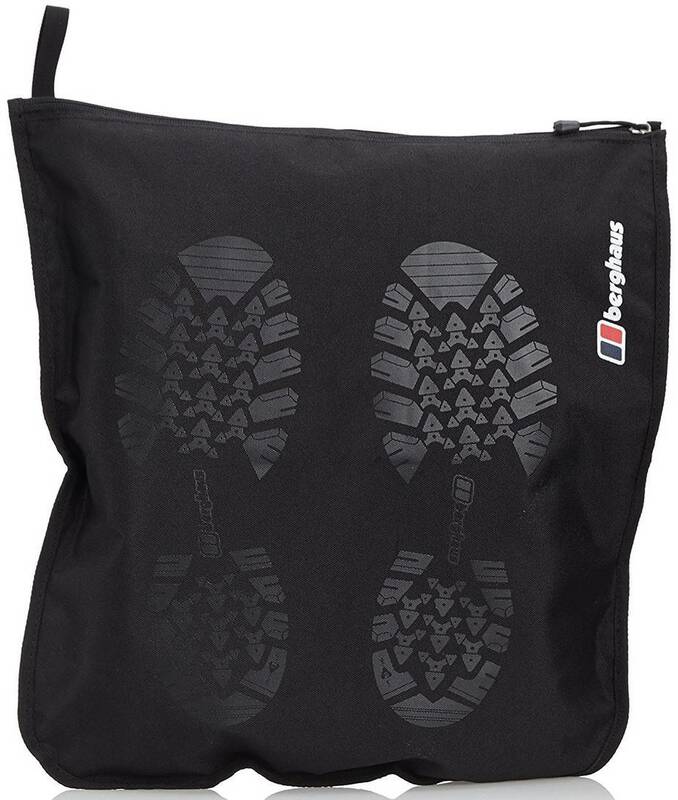 This Berghaus fabric bag is easy to fold and store away when not in use. It is much larger than it looks in the picture, and can comfortably fit all sizes of shoe inside, even those larger than a 13. It has a secure zip fastening which is great for easy access, and when the mud dries inside the bag all your need to do is tip it upside down, and it will empty. It can also be used as a mat in your car for passengers or while you are driving. This way, your car carpet does not become muddy, and it is instead collected on the mat. The same goes for wet shoes and boots, protecting your carpet and flooring. Plus, it comes at a very low price. It does not have a handle, which can make the bag a little trickier to carry, especially if you are transporting boots inside it from once place to another. This nifty and versatile little bag is fantastic for hikers and walkers alike. No matter where you have been out exploring, this boot bag will keep your car and home free from mud as it keeps your boots and the mud they contain safely inside. At a very low price, this is an excellent buy for every type of trekker. 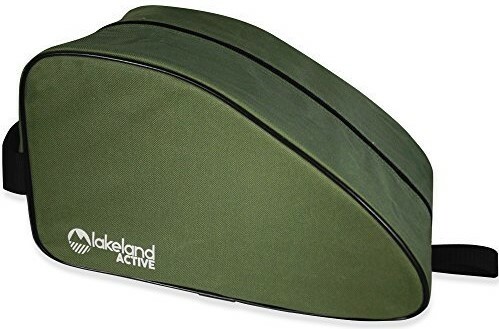 A reliable and trusted brand, Lakeland produce a wide range of quality hiking equipment, and their boot bags are no different. Featuring a stylish as well as handy design, this bag may be a little higher on the price scale, but it is certainly worth it. Take a look at the reviews and see for yourself. The great thing about this sturdy and durable boot bag is that it folds up neatly when you don’t need it, so it is much easier to store than most others. Not to mention that the material used is very thick, which keeps its structure strong but also prevents leaks from occurring. It is water resistant, and this applies to both the inside and outside of the bag. It has a strong webbing carry handle, which makes is easy to transport, along with four feet on the bottom to keep it sturdy and protect your floor from being scratched. Plus, they fit just about any boot size and the inside is very easy to clean. Made by a trusted and reliable brand, this could be one of the best boot bags available. Water resistant and made with a very thick material, it is not only durable but also foldable when you need to put it away. Easy to wash out on the inside and out, it may be a little pricier than the others, but it is worth every penny. If you are looking for a snazzy bag at a reasonable price, then this could be the one for you. Firm and well-constructed, it is sure to keep your boots dry and secure while you transport them to and from your hiking location. Why not have a look at the reviews while you try to determine if these are right for you. This boot bag is not only strong and durable, but it is also completely water resistant so that even in wet weather, your boots won’t become damper than they already were. The bag itself is also lined, for extra protection from the inside. They are large enough to fit just about any size of shoe or boot. It has twin zips, which is great in case one becomes jammed, and there are four feet on the bottom to keep it sturdy and protect your flooring. It is lightweight and has a strong webbed handle to make carrying it around much easier. Not to mention the excellent design. There have been no issues with this particular boot bag so far. Affordable and reliable, this could be one of the best hiking bags on the market, thanks to its spacious design and thoughtfulness with regards to the water resistance and the feet that have been placed on the bottom. At an affordable price, this is a hiking boot bag that you won’t want to miss. There are some fantastic boot bags listed here, and it can be quite tough to choose. However, for us, the clear winner is the Lakeland boot bag. It has everything you need in one sturdy package. 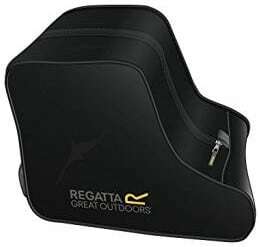 Of course, if you are looking for something a little less expensive then bags from brands like Regatta offer cheap bags that are still excellent quality. No matter your budget there is something here for you. What did you think of our hiking boot bag selection? Are there any you would have added? We love hearing from you, so feel free to leave a message in the comments below.